Transportation Costs > How Much Does it Cost to Program a Key Fob? How Much Does it Cost to Program a Key Fob? In the past, a car key was a basic cut with no security features. You could simply go to a locksmith to get a new key, but with a key fob, however, the process is much different. There are some key fobs that have a separate key that starts the car and can also unlock the doors. If this is the case, replacing or reprogramming a key fob would not be vital since you could still use the key to get in and out of the car. There are other key fobs, however, that is part of the key itself. If this part were lost or damaged, getting a new one is your only option. Depending on the make and model of the car, a key fob is designed to unlock a door or trunk. This fob is generally attached to the keychain. On average, programming a key fob is going to range anywhere from $40 to $100, depending on the make and model of the car. Most of the time, this can be done on your own, however, bringing down the costs. This is the price for the programming labor only and won’t include the price of the key and/or keyless entry device. If you needed the key and keyless entry device, for instance, then you could easily add another $100 to $250 to the estimate if purchased at a local dealership. NOTE: These were the estimates for the programming labor ONLY and didn’t include the key. According to Edmunds.com, they state that an electronic key fob can cost $50 to $90, depending on the complexity of the design. Users on DodgeTalk.com stated that they paid $40 to $50 to have a dealer program their fob. Using radio wave signals, the key fob will be able to communicate directly with your car. The car and the key fob will both have memory chips that enable the fob to work. When the fob button is pressed, it will send a code to the car telling it what it should do. With most basic installation jobs, the car key will have to be inserted into the ignition and turned to the “on” position. When in position, a special action may be needed a few times in a row for it to go into program mode. When the car is in programming mode, a button on the fob will have to be pressed to make it work. A key fob can either be purchased from the dealership or a third-party locksmith if they have the right equipment. 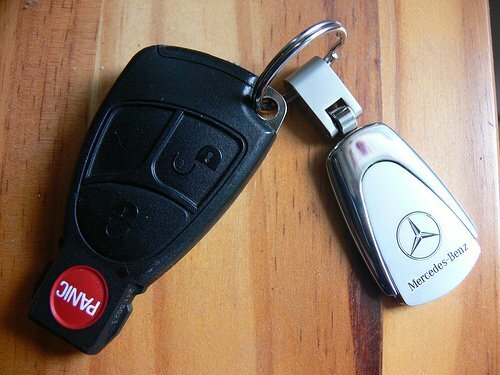 The way that the key fob is programmed will depend on the make and model of the car, not the specific key fob. As mentioned, the key fob itself will be an additional charge, and the price will depend on how you purchase it. At a local dealer, the fob could cost upwards of $150+ for both the key and keyless entry device, whereas the third party seller on eBay could sell a knockoff brand for a lot less, often around $25 to $50. If you are going to buy online, always make sure that the model is going to work with your make and model of your car. When buying a fob, you will need your car’s make, model and the year it was manufactured. To find out how to program your remote, refer to ProgramYourRemote.com to save money. Talk with the dealership where you bought the car from in the first place. Depending on the dealer, some may be able to program the key for free or for a discounted rate as long as you have the fob. Most dealerships should be able to offer a quote over the phone if you call ahead of time. Oftentimes, there is a way around this fee. Most key fobs can be programmed with a certain combination of button presses. If you cannot find this inside of the owner’s manual, consider looking for a how-to guide on the internet. Consider looking for aftermarket fobs from an online store or local locksmith. However, with most third-party products, be sure to research before making the purchase as some are made with cheaper materials. Try to avoid going to the dealer and consider looking for key fobs on Amazon and eBay or if you don’t want to deal with the programming, consider hiring a local locksmith. Always try to program a key fob on your own before heading to a dealership. It’s a lot easier than you think.